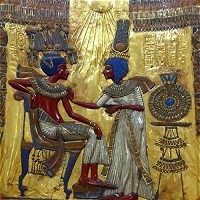 In Ancient Egypt there were a number of different crowns that could be worn by the Kings, the Gods and the Royal Women. The most frequently depicted, and easily recognisable of the crowns worn by the kings of Ancient Egypt were the Red Crown - Deshret (Crown of Lower Egypt), the White Crown - Hedjet (Crown of Upper Egypt) and the Double Crown - Pshent (symbolising the Unification of Upper and Lower Egypt). "Glory be to thee, O Osiris Un-Nefer, thou great god in Abtu (Abydos), King of Eternity, Lord of Everlastingness, God whose existence is millions of years, eldest son of Nut, begotten by Geb, the Ancestor-Chief, Lord of the Crowns of the South and the North, Lord of the High White Crown." The Crowns of the Kings and gods played a important role in Ancient Egypt, and they were never depicted without one. Over time the number of crowns and headresses worn by the king grew, with each crown imparting, upon the wearer, specific aspects symbolised by the nature of the crown. Even though no real crowns of ancient Egypt have survived there is an abundance of examples depicted on statues and reliefs, however their actual size and composition is still uncertain. (The Bright One - hdt). 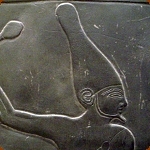 The crown of Upper Egypt is a tall white conical crown, known from as early as the Pre-Dynastic Period and is depicted on the Narmer Palette, it is associated with the kingship of the two lands. Worn by the king to show him as ruler of Upper Egypt. Nekhbet, the goddess of Nekheb, was depicted as a woman, sometimes with the head of a vulture, wearing the White Crown. (The Red One - dsrt). 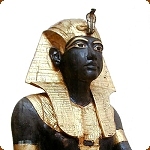 The crown of Lower Egypt is a stair like headress suplemented by a wire that ends in a spiral. This crown is also depiceted on the Narmer Palette and is worn by the king to show him as rule of Lower Egypt. Wadjet, the goddess of Dep (Buto), was usually depicted as a snake headed woman or as a snake wearing the Red Crown. The Double Crown - Pschent. (The Two Powerful Ones - sekhemti) This was the Double Crown of Ancient Egypt and it symbolised the unification of Upper and Lower Egypt, it was worn by the king to show him as a ruler of both Upper and Lower Egypt. It was usually adorned by the uraeus, symbolising Wadjet Goddess of Lower Egypt and a vulture representing Nekbet and were known as the Two Ladies. The earilest examples come from the First Dynasty King Den. (War Crown - hprs). One of the most common crowns found in Ancient Egypt, it can be first found from the Second Intermediate Period worn by Amenhotep III. 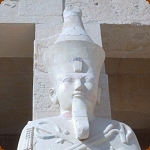 New Kindom Pharaohs are often shown wearing it in battle, but it was also frequently worn in ceremonies. It was a blue helmet like crown adorned with golden sun discs, and like many Egyptain crowns, had a uraeus and vulture on the brow. (nws). This was a striped cloth headress worn almost exclusively by the king in representations. 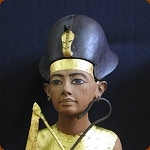 The most famous example can be seen on Tutankhamun's golden mask. 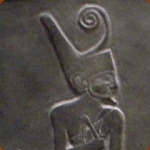 The brow was decorated with the uraeus Wadjet and the vulture Nekhbet. It was associated with Re-Khepri at Sunrise and also with Horus, who bestowed it upon Osiris in order to bring about his rebirth.